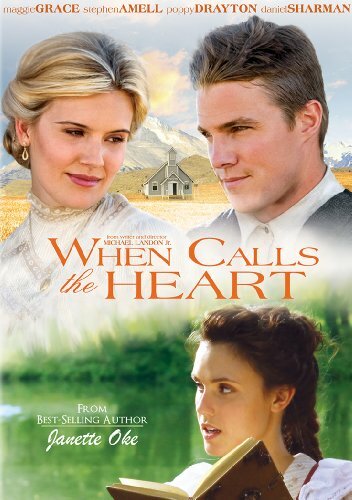 When Calls the Heart is the story of Elizabeth Thatcher, a young teacher accustomed to her high society life, who receives her first classroom post in a prairie town in the Western Frontier lead by headstrong coal miner widows.. She is determined to prove to her family that she is brave enough to live on her own, but struggles with her own fears and doubts. Directed by: Michael Landon Jr. When Calls the Heart is the story of Elizabeth Thatcher, a young teacher accustomed to her high society life, who receives her first classroom post in a prairie town in the Western Frontier lead by headstrong coalminer widows Abigail (Loughlin) and Frances (Smart). She is determined to prove to her family that she is brave enough to live on her own, but struggles with her own fears and doubts. When she discovers her late Aunt Elizabeth's (Grace) secret diary, Elizabeth learns she was a pioneer woman herself, a teacher in the frontier who struggled with prairie life and fell in love with a Royal Canadian Mountie (Amell). Inspired by her aunt's hopeful words and unfaltering determination, Elizabeth decides to embark on her own adventure, using the diary as her guide and family friend Edward, another Mountie, as her support. Based on the Canadian West Book Series by Janette Oke, well renown author of over 75 books, most notably Loves Comes Softly.